Watch the Annual meeting as it happens LIVE, and still get CME credit. Can't make the conference this year? We will be offering live streaming of select course and tracks on Sunday May 15 through Tuesday, May 17. The live streaming video will also be made available 10-12 business days after the live event for you to view in case you are unable to watch it live. CEUs are available. 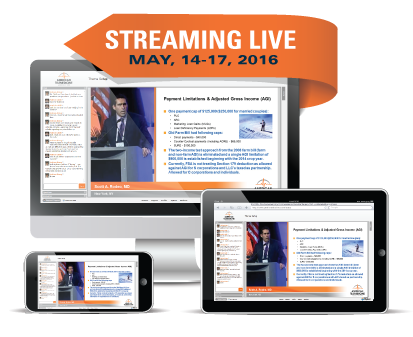 Click here to register for ATA 2016 live streaming. How to Build an Online Primary and Urgent Care Service - Primary Care and Urgent Care play a pivotal role in the overall healthcare delivery system. Using telemedicine technologies within these frontline care models optimizes provider efficiency, provides better management of patient panels, improves service to rural populations, and offers patients anytime and anywhere access. Such advances hold the promise of significantly expanding the cost effective delivery of quality medical care. ATA's Operations Sessions focus on how to overcome transformational challenges to implementing telemedicine services. Click here to view the Operations track. Plenary sessions include panels and discussions facilitated by top healthcare industry thought leaders. Click here to view all plenary speakers. *Options 1 and 2 are available for purchase together.